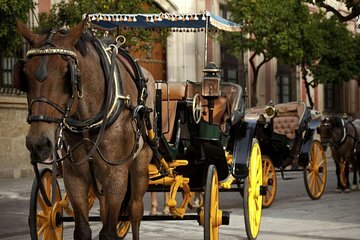 Meet your guide at your hotel and hop aboard your traditional horse and carriage for a thrilling evening sightseeing tour. Soak up the atmosphere of Cartagena after-dark as you amble through the city streets, passing the modern buildings of Bocagrande, dramatically illuminated at night. Clip-clop through the cobblestone lanes of the Old City, a UNESCO World Heritage site, and admire the brightly painted colonial buildings and historic city walls, lit up by streetlamps. Listen as your guide points out landmarks like the Palace of the Inquisition, the Cathedral de San Pedro Claver and Plaza de Santo Domingo; snap photos of the striking city skyline and cuddle up in your carriage as you watch the world go by. End your carriage ride with drop-off at a local restaurant and head inside to enjoy a delicious 3-course meal, accompanied by a glass of wine – the perfect end to a perfect evening! After confirming it one day before, we were simply left waiting at the hotel. Later we were told by the Hotel Reception Desk that someone had been looking for us by 7:00 PM instead of 8:00 PM , which I have writen at my trip voucher and also were confirmed a day before. It was really frustrating for a night we as a couple have planned carefully to spend some time together at our last night in Cartagena. Do not recommend this at all.